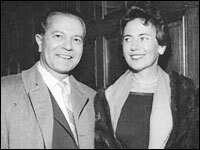 NPR ran a story today about a lost tape of a speech given by Martin Luther King to Temple Israel in Los Angeles in 1965 at the invitation of Rabbi Max Nussbaum (seen in the photo with his wife, Ruth). Rabbi Nussbaum has passed, but his 95 year old widow, Ruth, apparently uncovered the tape. Listening to it, one hears King’s distinct delivery and the fervor of his belief. Of course, this hearkens back to a time when the Jewish and black communities in the US were partners in the fight for achieving civil rights for all citizens. Nussbaum was a German rabbi who lived in Germany under the Nazis before making it to these shores. The NPR story has a “Listen” button to hear the report, including Ruth speaking about the event, the heavy security surrounding King, and of course, her husband. There is also a link to the full sermon given that day by Martin Luther King. Very cool… I like his lines about our country having “guided missiles and misguided men”. And I didn’t know the Rev’d had ever gone to India! Fitting for this to come out at (about) the same time as a precedent-setting visit by an Orthodox Rabbi to a mosque (in NY, reported in Haaretz). Were any NYC readers there?